Their system has a dense collection of parallel cotton threads linked vertically, with a continuous stream of water droplets flowing down the strings. The “web” of water droplets captures the rising water vapor, pushed upward by a fan, and it condenses. The obtained water is then transported into a collecting container. In comparison with current technologies, the efficiency of capturing water vapor was increased by 200% with this technique, report scientists. The research was reported in Science Advances and comprises of a theoretical model of the system and experimental outcomes from a prototype. 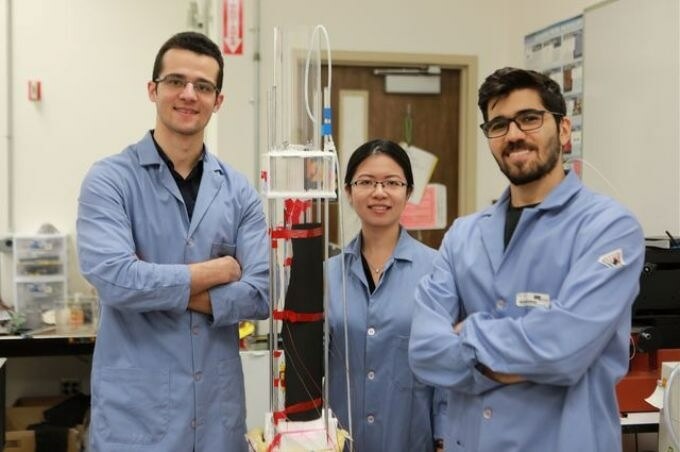 The method could not only harvest water from the atmosphere but could also be used to obtain clean water from the evaporation of high-salinity wastewaters, such as those resulting from oil and gas production, or from irrigation runoff. Moreover, it could be used to trap steam escaping from cooling towers in power plants and industrial facilities. The trapped water could subsequently be recycled back into the cooling system. The growing global concern over the scarcity of fresh water has motivated the development of economically feasible ways to capture water vapor. This idea of imitating the natural rain cycle to produce clean water, called ‘the humidification-dehumidification process,’ has been around for quite some time. However, making such a system that’s inexpensive to build and operate has been a major challenge. Our system is inexpensive, lightweight and energy-efficient. These factors can potentially help overcome challenges for its adoption. Sungtaek Ju, Professor, Mechanical and Aerospace Engineering, UCLA Samueli School of Engineering. Sungtaek Ju is also the lead investigator of the research. Some projected water vapor capture techniques have used cooled metal to make water vapor condense on a surface. However, restricted surface areas, and also weight, material, and manufacturing costs, have delayed their adoption. In the same way, techniques that use spray nozzles or electric fields use too much electricity to be feasible. A vital component in the system developed by the UCLA team is its capability to constantly produce water droplets of the same size and steady flowing speed. These water beads allow the system to efficiently trap water vapor, without causing considerable pressure fall and thus fan power consumption. The liquid beads form highly curved surfaces that enhance the rate at which water vapor diffuses through the air. Simply said, this is analogous to a snowball rolling downhill. The beads are picking up water vapor as they travel down. And while a drop may seem small, think of an entire array of threads working constantly. The water vapor harvested could add up to quite a bit. Abolfazl Sadeghpour, Study Co-Lead Author and Graduate Student, Mechanical Engineering, UCLA. Recent mechanical engineering doctoral graduate Zezhi Zeng is the other co-lead author of the study. Other authors include postdoctoral scholar Hangjie Ji of mathematics, UCLA graduate student Navid Dehdari Ebrahimi of mechanical and aerospace engineering, and Andrea Bertozzi, a distinguished professor of mathematics and mechanical and aerospace engineering and UCLA’s Besty Wood Knapp Professor for Innovation and Creativity. The National Science Foundation and the Simons Foundation supported the study.